We are offering Medicine Side Cupboard Deluxe to our clients. A 3 side closed bed side locker having a machine pressed stainless steel top with MS sides and a self locking ventilating door. Constructed from square CRCA tubular frame fitted with rubber stumps and finished in pretreated epoxy. Overall dimensions: 41 x 41 x 81 cm (Width x Depth x Height). We are offering Bed Side Locker Three Shelves to our clients. 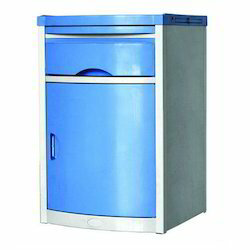 - Overall approx size: 40cm L. X 91cm W. X 61cm H.
- One drawer at upper side. - One box at Bottom. 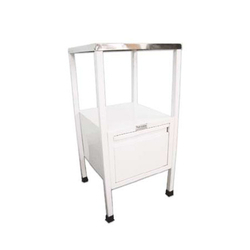 With the help of our expert team members, we have been able to provide Bedside Locker.